Julia Child is famous for revolutionizing home cooking in America by bringing us the essential French repertoire of classic dishes and now 32 of her recipes come alive for the first time on the iPad. These 32 recipes are the most often prepared and best-loved dishes from the book Mastering the Art of French Cooking, Volume 1 and include careful explanations of technique, discuss buying the right ingredients (or finding substitutes), and planning ahead. In addition to the recipes, Mastering the Art of French Cooking: Selected Recipes includes colored photos of each finished dish, 30 video clips from The Way to Cook video series, audio pronunciations of the names of French dishes, and more. The entire app has a very clean, clutter free look that I really like. If you tap the menu banner, it will slide down to reveal 7 different sections: Recipes, Julia, Shop, Videos, Resources, Excerpts, and Grocery List. The Recipes screen is a horizontal menu of beautiful photos. Above the recipes, you will see various Juila Child quotes, like "The perfect vinaigrette is so easy to make that I see no reason whatsoever for bottled dressings." At the bottom of each photos is a banner that displays the name of the dish, both in French an English, a share button that let's you announce the fact that you are cooking a specific dish from the app to Facebook, a star button to mark the recipe as a favorite, and an audio button to listen to the name of the dish pronounced in French. 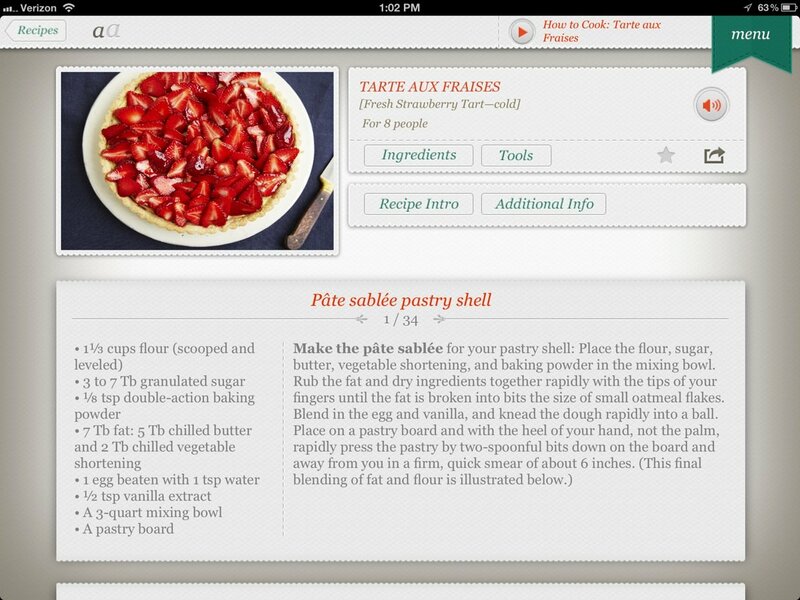 Each recipe is nicely displayed with the ingredients needed for each step displayed to the left of each step. The directions are very clearly written and easy to understand. There are also buttons to see the entire ingredients list with the ability to add them to your grocery list, a list of tools needed (like a saucepan), a recipe intro, additional info related to the recipe (like the benefits of using a pressure cooker), and variations of the recipe. At the top of the screen, you'll see links that'll take you to related videos in the app. The Julia section of the app includes a bunch of photographs of, or related to, Julia Child. Each photograph includes a caption that describes it. The Shop section of Mastering the Art of French Cooking: Selected Recipes includes the four Juila Child books that are available in the iBook Store. Tapping on the book will take you to the iBook Store. 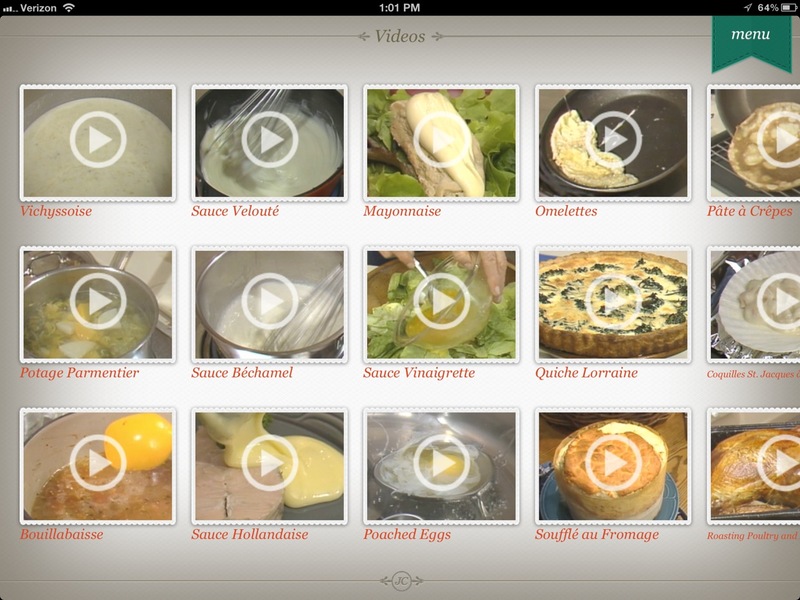 The Video section includes 30 video clips from Julia Child's The Way to Cook video series. The videos aren't of the highest quality, but that is to be expected considering how old they are. What shouldn't be expected is the poor scrolling that you will experience on the videos page. Does not fully support the new iPad's Retina screen, including the icon. All the main in-app graphics are Retina-ized, but some buttons are not. It's ugly. Share button is for Facebook sharing only. Why is it a generic share button? It should be a Facebook button! Mastering the Art of French Cooking: Selected Recipes is a great app for anyone interested in Julia Child's recipes and videos. Except for the poor scrolling on the video screen, the app is beautiful and very well made. In celebration of Julia Child's 100th birthday on August 15, Mastering the Art of French Cooking: Selected Recipes has an introductory price of $2.99.